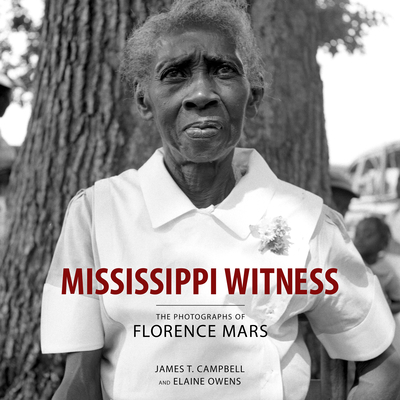 Mississippi Witness: The Photographs of Florence Mars (Hardcover) | Turnrow Book Co. The crime transfixed the nation. As federal investigators and an aroused national press corps descended on Neshoba County, white Mississippians closed ranks, dismissing the men's disappearance as a "hoax" perpetrated by civil rights activists to pave the way for a federal "invasion" of the state. In this climate of furious conformity, only a handful of white Mississippians spoke out. Few did so more openly or courageously than Florence Mars. A fourth-generation Neshoban, Mars braved social ostracism and threats of violence to denounce the murders and decry the climate of fear and intimidation that had overtaken her community. She later recounted her experiences in Witness in Philadelphia, one of the classic memoirs of the civil rights era. Though few remember today, Mars was also a photographer. Shocked by the ferocity of white Mississippians' reaction to the Supreme Court's 1954 ruling against racial segregation, she bought a camera, built a homemade darkroom, and began to take pictures, determined to document a racial order she knew was dying. Mississippi Witness features over one hundred of these photographs, most taken in the decade between 1954 and 1964, almost all published here for the first time. While a few depict public events--Mars photographed the 1955 trial of the murderers of Emmett Till--most feature private moments, illuminating the separate and unequal worlds of black and white Mississippians in the final days of Jim Crow. Powerful and evocative, the photographs in Mississippi Witness testify to the abiding dignity of human life even in conditions of cruelty and deprivation, as well as to the singular vision of one of Mississippi's--and the nation's--most extraordinary photographers. James T. Campbell is Edgar E. Robinson Professor in United States History at Stanford University. His previous books include Middle Passages: African American Journeys to Africa, 1787-2005. Elaine Owens recently retired as director of the image/sound archives at the Mississippi Department of Archives and History, where she helped to collect and curate the Florence Mars Collection.